This post about my experience using 23andMe health + ancestry test to find out more about my ancestry is sponsored by 23andMe. All thoughts and experiences are my own. My mom and adopted dad (ie, he’s the dad who raised me, but we’re not related by blood) recently took DNA tests and sent the results around to me and my siblings. We were all interested to see what a genetic test said about our ancestry, particularly since our family has done years and years of family history research. How did our physical research compare with the scientific results of a DNA test? The second question everyone in the family had was what differences I would see in my results since I have a different biological dad than my four other siblings. According to the genealogical research my family has done, we can follow both my maternal and paternal lines for many generations back to England and Ireland. I love looking as far back as I can on my family tree and finding Counts and Dukes and Ladies and even a Master of the Mint (it just sounds cool!) sprinkled through my family tree. I’ve found an ancestor who was one of the original Jamestown Colonists. Every story fascinates me and I want to learn more. 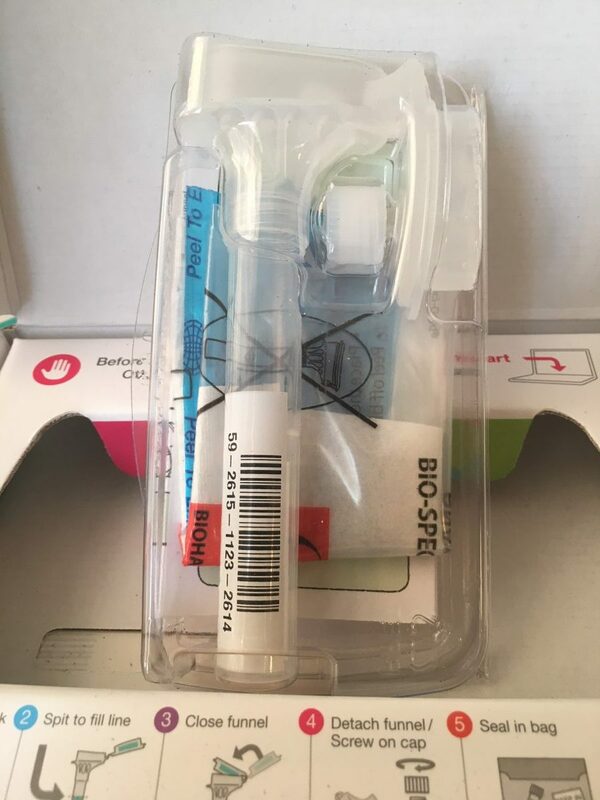 My mom and dad have been urging me to take a DNA test to see how my results compared to theirs, so when I received a 23andMe collection kit in a Babblebox kit last month, I was eager to spit in the tube and send the kit back in to be tested. As luck would have it, I got sick right after I got my collection kit, so I delayed sending in my saliva until it was looking a little more normal, if you know what I mean. Collecting the required amount of saliva for the test was not difficult but it did take a little while. I just kept the collection tube on the counter next to me as I cooked dinner and spit as often as I could. Honestly, it sounds worse than it is! The kit came with detailed and easy-to-follow instructions for collecting a sample to send in. Perhaps the most important part of the sample collecting process was registering the kit BEFORE sending it off in the mail. You just create your 23andMe account on their website and tell them the numbers on your box. While I waited for my test results to be processed, I answered a bunch of health related questions to give the system a better understanding of who I am and where I’m coming from. The extra questions are voluntary and not necessary for 23andMe to process your results, but they help paint a bigger picture, not only for you, but for others who have taken and will take the DNA test. To determine your Ancestry Composition, we use an algorithm that looks at short, non-overlapping segments of your DNA. We compare each segment of your DNA to reference DNA sequences. We have defined 31 ancestry populations from around the world using reference datasets that include over 10,000 individuals with known ancestry. When a segment of your DNA matches the reference DNA from a specific population with a high degree of certainty, the segment is assigned to that population. Sometimes the segment matches reference DNA from several populations, in which case it is assigned to a broad ancestry (e.g. Northwestern European). The results of all of these assignments are then tallied across your genome to determine your Ancestry Composition. I was secretly hoping that I’d find some cool, mysterious result, but instead the DNA test showed me exactly what I’ve discovered through family history research. I love it! Also included in my results were dozens of wellness and carrier reports. 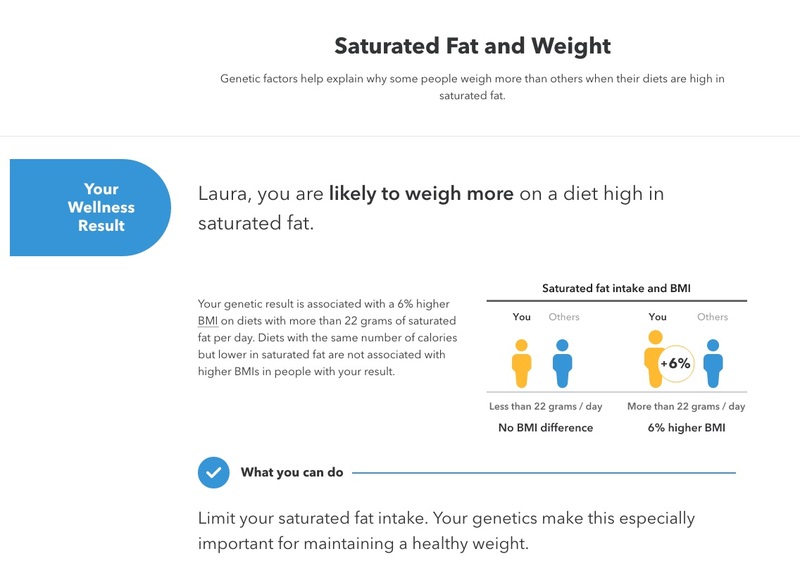 For instance, my DNA can actually tell me that a diet high in saturated fats is likely to make me gain weight (more than the average person). The report also told me genetic traits that I was likely or unlikely to possess. 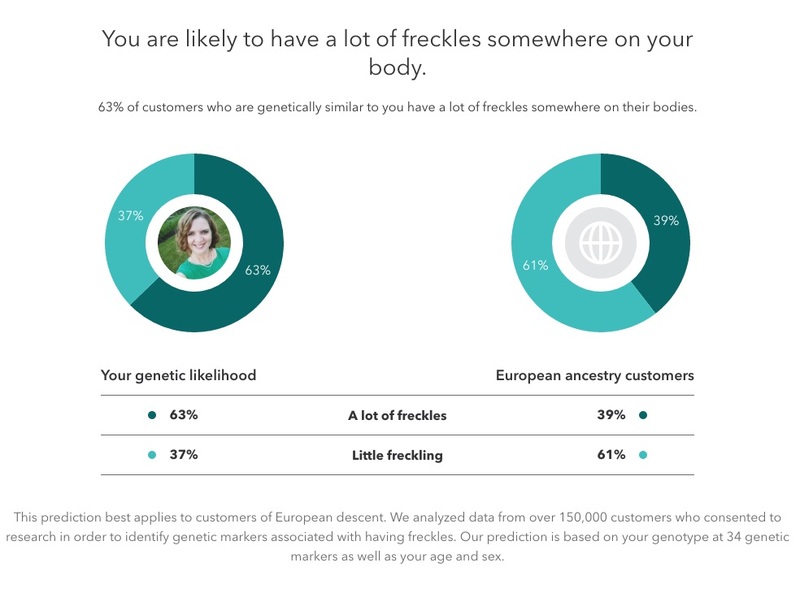 It’s not a far stretch to predict that I will have fair skin and freckles, based on my ancestry! I loved seeing the picture my DNA painted of me, and would highly recommend doing it for yourself! Get your kit HERE! In fact, the 23AndMe DNA Collection Kit *may* just be the perfect last-minute gift for the holidays (or birthdays, or just any day). How it works: Provide your saliva sample from home. 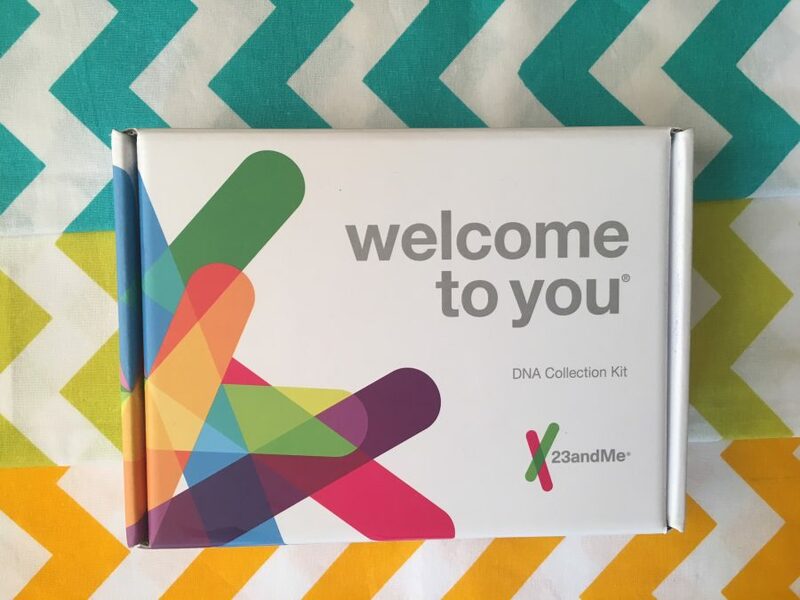 Mail it back to the 23andMe lab in the same kit it came in; the postage is prepaid. 1. Ancestry reports: Your DNA can tell you about your family history. 3 Reports: Ancestry Composition, Maternal & Paternal Lineage, Neanderthal. 2. Wellness reports. Your genetics can help you make more informed choices about your diet and exercise. 5+ Reports: Caffeine Consumption, Lactose Intolerance, Muscle Composition, Alcohol Flush Reaction, Deep Sleep and Sleep Movement. 3. Traits Reports. Explore what makes you unique, from food preferences to physical features. 19+ Reports. Example reports: Hair Loss, Sweet vs. Salty Preference, Unibrow. 4. Carrier Status: If you are planning to start a family, find out if you are a carrier for an inherited condition. 35+ Reports. 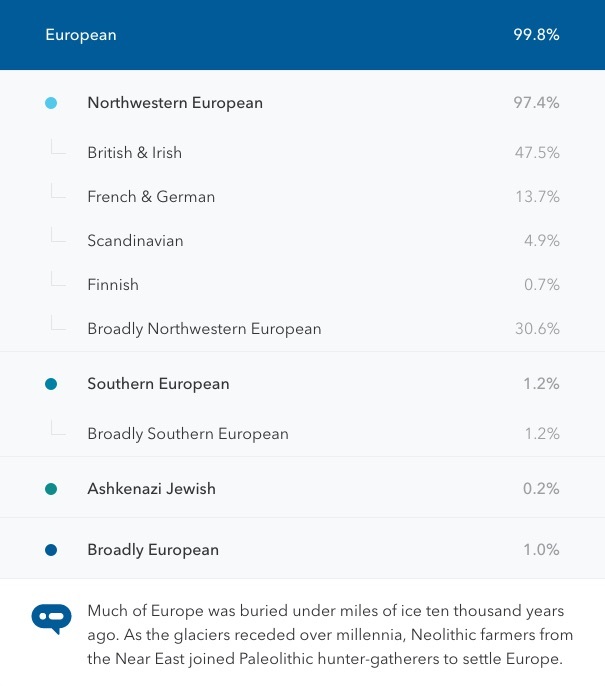 See 23andme.com/beforeyou-buy important information about these reports. This is so fascinating. I would love to do this. Is it rude to just ask you, what does it cost? Hey Margot, Nope! Not rude at all. You can find out about different packages on the links within the article, but the basic package is $99 (for the kit to be sent to you, the return shipping, and results). So interesting, I’m half Japanese but I don’t know what all wold be on my caucasian side. I would be interested to find out.